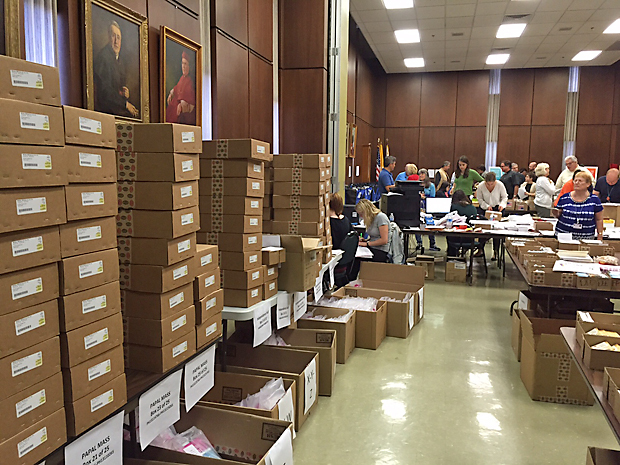 Boxes of tickets were ready to be distributed to parishes of the Archdiocese of Philadelphia, whose representatives picked them up beginning Monday, Sept. 14 at the Archdiocesan Pastoral Center. 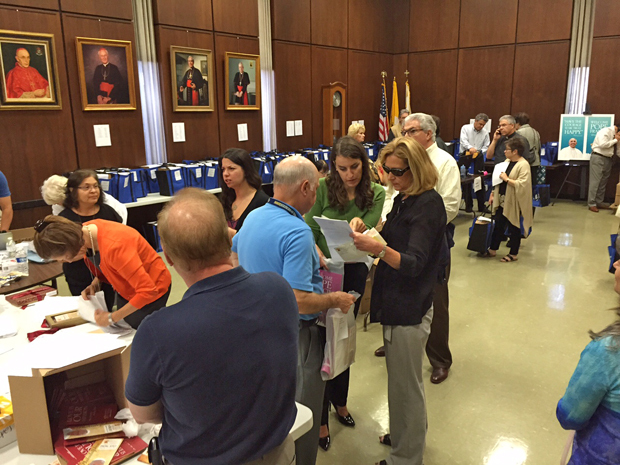 Representatives of parishes throughout the Philadelphia Archdiocese stopped into the Archdiocesan Pastoral Center in Philadelphia to pick up parish materials for the visit of Pope Francis, including especially tickets to public papal events. Most parishes had been given on average about 400 tickets, with larger parishes receiving 600 and more, depending on their size. Volunteers unpacked boxes of tickets for the Festival of Families and the papal Mass on the Benjamin Franklin Parkway to be distributed. The tickets display the section, row and seat number above a bar code to be scanned before entrance into a designated reserved ticketed area. The ticketed area of the parkway extends roughly along it length from Eakins Oval at approximately 23rd Street to 20th Street. The tickets that number presumably in the thousands — the precise number has not been confirmed by organizers of the papal events — for each event on Sept. 26 and 27 are not among the 10,000 tickets that were snapped up within minutes of being made available online last week. Several parishes indicated they have designated tickets to parishioners who signed up early last spring and summer to travel to the events with bus groups organized through the parish. 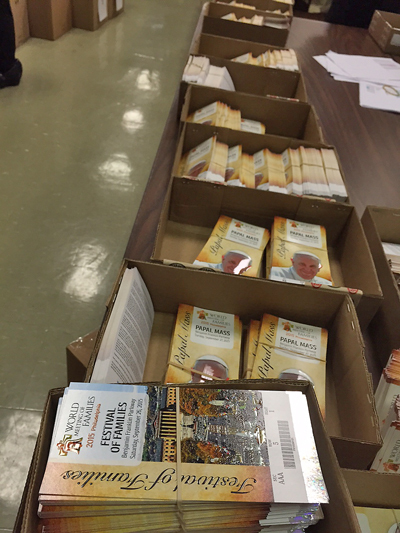 Volunteers organize packages of papal-event materials for distribution to parish representatives.